MK slams violence by hareidi extremists: "We can't allow concern for the dead to come at the expense of the welfare of those who are alive." Following two days of violent demonstrations by the extremist "Atra Kadisha" group over a Beit Shemesh construction project, hareidi-religious MK Rabbi Dov Lipman has weighed in to the dispute, slamming the violence as a "desecration of God's Name." Lipman, an MK for the Yesh Atid party and a Beit Shemesh resident himself, said that hareidi extremists had crossed a line in their protests against construction work at the Golobentzich site in Ramat Beit Shemesh, which they say is also the site of ancient Jewish burial caves. "After two days in which extremists lit fires in our beloved city of Beit Shemesh, we can no longer sit quietly," declared Lipman in a statement Tuesday, adding that "We are dealing with something which is endangering the lives of the residents of Ramat Beit Shemesh and the entire area." Lipman continued​ by calling on the authorities to take a hard line with the perpetrators and crack down seriously on their violent activities, as well as on "incitement" by their leaders. "I applaud the police for arresting the hooligans but the process must continue further. They cannot be released to their homes but must experience the full strictness of the law. And this must not only be applied to the hooligans but also to those who sent them - the rabbis who incite them. "We cannot allow concern for the dead to come at the expense of the welfare of those who are alive. This is a desecration of God's name and disgraces Judaism." 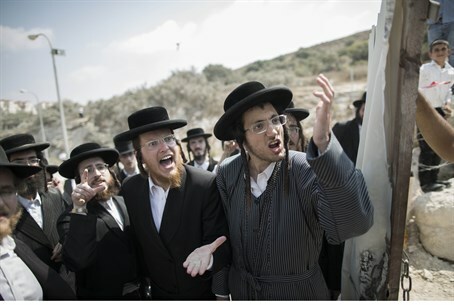 The protests in Beit Shemesh and Jerusalem have been led by Hareidi extremists from the Atra Kadisha group, which holds demonstrations whenever they believe construction is being carried out at a location that holds ancient graves. Jerusalem Police yesterday detained 14 of the rioters, 13 of them for disturbing public peace and one for attacking a policeman. Following those arrests, rioters set garbage containers on fire on Nehar Hayarden Street in Beit Shemesh, and blocked the road. Large police forces arrived and tried to disperse the rioters, while a fire crew battled the flames from the burning garbage containers. Riots also took place in Me'ah Shearim in Jerusalem, where hareidim overturned garbage containers and blocked a road to traffic. In total, 20 rioters are currently being held as of Tuesday. The Ramat Beit Shemesh plot is being developed by the relatively moderate Lithuanian stream, which notes that a committee headed by Rabbi Nisim Karelitz - a highly respected hareidi rabbi - determined that there was no reason not to go ahead with construction. Nevertheless, according to the Maariv newspaper hareidi extremists came to the home of hareidi developer Aryeh Golobentzich, whom the project is named after, and beat him severely, to the point that he had to be taken to a hospital. A Channel 2 investigative report last year presented testimony according to which Atra Kadisha seeks payments in exchange for allowing construction and archaeological work at various sites, vandalizes valuable archaeological finds and threatens contractors and archaeologists. Atra Kadisha denied the charges. It claims that all of its actions are motivated by respect for the deceased, whose graves must not be violated by land developers and archaeologists. In an attempt to calm the situation, a special committee has been set up by Rabbi Chaim Kanievski, who is considered one of the hareidi world's most prominent rabbinic figures, as to whether the disputed building project should continue to go ahead. The committee is set to present its findings in the next few days, but it is unclear as to whether Atra Kadisha and its supporters will respect the decision if it goes against them.